This means that how cities develop is important both for growth and for climate change. The Sustainable Development Goals recognise the centrality of future urban development to achieving sustainability goals, in setting out Goal 11 to make cities inclusive, safe, resilient and sustainable. With growing numbers of poor people now concentrated in urban and peri-urban areas, investment in better urban infrastructure – designed to meet the needs of the poor – can also offer huge resilience dividends. This includes providing access to electricity and clean water, alongside of building schools and health clinics where the broader benefits of a sustainable infrastructure agenda include helping to keep children healthy and in school while building better livelihoods for their parents. Sanitation systems and sewers also build resilience, because during floods, lack of adequate sanitation is closely linked to disease outbreaks. Public transit, district heating and building efficiency also all have poverty reduction benefits for the poor because they increase access and reduce costs of services to the poor, while also providing global benefits by reducing greenhouse gas emissions and future climate risk. Finally, improved flood management systems build resilience for all, but will disproportionately benefit the most vulnerable populations, including the urban poor who often settle in flood plains. Getting infrastructure right in cities is fundamental if we are to build future prosperity, reduce poverty, strengthen resilience to climate change and extreme events and reduce greenhouse gas emissions and pollution. In many countries, urban development has followed a sprawling, inefficient model that leads to congestion, car-dependency, high resource use and high GHG emissions. Yet an alternative is starting to emerge – one focused on compact, connected and sustainable urban growth to create cities that are economically dynamic, vibrant and healthy. Such cities are more productive, socially inclusive and resilient, as well as cleaner, quieter and safer. It is a win-win for the economy, the people and the environment. Building urban resilience is complex, particularly for rapidly growing cities but it is increasingly part of the agenda for cities around the globe. The more resilient a city is to shocks and stresses, the greater the likelihood that the city will “bounce back” to its normal state and citizens will resume their lives and livelihoods with the least loss to property and life.6 Cities can increase their resilience each time a shock or stressor affects them by “building back better” to be more prepared for future events. Low income countries in particular are facing the challenge of pursuing development pathways (including substantial investment in infrastructure) while facing growing adverse impacts of climate change. Ensuring that investment in infrastructure takes climate change risk into account, including higher risk from natural hazards such as extreme temperatures, floods and droughts, will determine its sustainability. On the other hand, poorly constructed infrastructure in rapidly urbanising areas intensifies climate risks and vulnerability to climate impacts. Many cities are also working hard at sharing what has worked and what has not, and learning from each other. For instance, Rotterdam is helping city officials in Ho Chi Minh City, which is topographically similar, create and implement a Climate Adaptation Strategy through the Connecting Delta Cities Network and develop financial resources and technical capacity.7 Global networks like the C40 Cities Climate Leadership Group, the Connecting Delta Cities Network and CityLinks can play a major role in this. The expected rapid growth in urban population will be most pronounced in emerging and developing countries, along with expected growth in economic output, energy consumption and carbon emissions. This growth will be led by large and fast-developing cities in emerging and developing economies, particularly in China, India, Southeast Asia and sub-Saharan Africa. These estimates still do not consider the investments needed to adapt urban infrastructure to climate risks, which is crucial. With their dense populations and, particularly in developing countries, often large clusters of people living in marginal areas, cities are highly vulnerable to climate change and extreme weather events. The risks are especially great for the 75% of the world’s large cities that lie on a coastline and are thus exposed to sea-level rise and storm surges.9 Estimates of capital costs required for urban infrastructure adaptation range from US$11–20 billion per year,10 to as much as US$120 billion per year by 2025–2030,11 indicating deep uncertainty on the numbers. Despite the critical importance of infrastructure for urban development, financing smarter, more sustainable urban infrastructure remains an immense challenge, particularly in emerging and developing economies, and particularly when it comes to large-scale projects. Competitiveness, population and business growth, and public safety drive infrastructure finance demand, though the sources of finance vary as do the specific trends that shape its supply. Finance for sustainable urban infrastructure is hindered by many of the same barriers faced by sustainable infrastructure in general, including market failures, short-term thinking, and a lack of bankable projects and capacity at the urban level to prepare projects. Many cities around the world are constrained in their ability to retain local revenue sources, take on debt, invest in major projects and engage in public-private partnerships. Many projects are also hampered by the fact that they involve public goods. The scale of the capital investments – especially for transport systems such as bus rapid transit (BRT), light rail, and underground rail systems – often far exceeds the ability of national and local governments. However, when public capacity to partner with the private sector is in place, public financing can crowd in private finance and investment and enabling conditions can incentivise it. In developing countries, international development finance can play a key role. 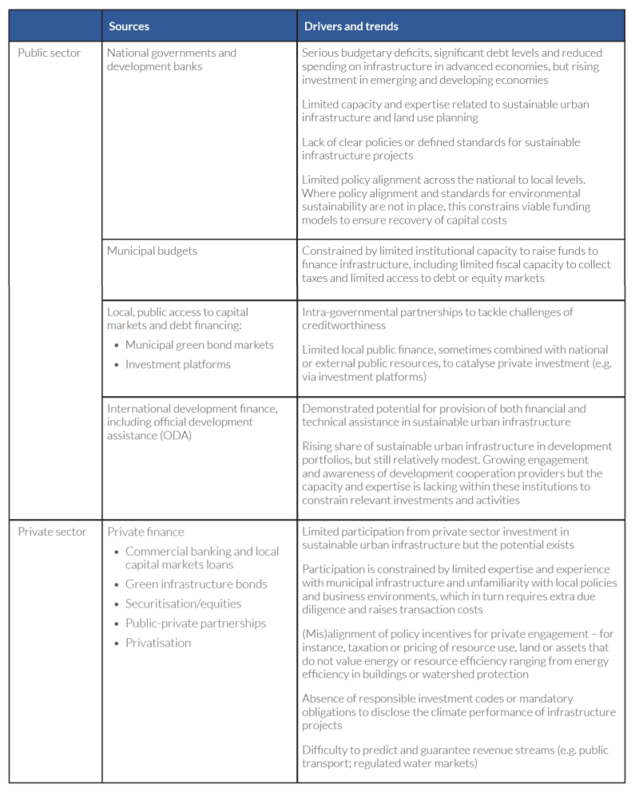 There are also financing challenges that are specific to urban infrastructure (see Table 4). National and local policies may not always be aligned, creating conflicts and, for investors, regulatory uncertainty. Cities often have limited capacity to plan, budget, and ability to secure finance for, and oversee such large projects. As indicated in the sub-sections that follow, a number of opportunities exist to address these challenges. In the three sections that follow, we examine how the three key action areas discussed in Section 2 apply to sustainable infrastructure in cities. Evidence suggests that higher fuel prices could lead to more compact urban development. For example, in the US, a 10% increase in fuel prices was found to lead to a 10% decrease in construction in locations with relatively long commutes.14 Land use regulations such as density standards and parking requirements can also influence the compactness of a city. Sustainable urban transformation requires reforming environmentally harmful subsidies and aligning fiscal policies to stimulate investment in sustainable infrastructure, land use and innovation. Key targets for reform include subsidies for car use, such as company car and parking tax credits, as well as subsidies for petrol and diesel (see Box 24). Some of these policies, which have large implications for urban areas, require national-level action. National and local governments are increasingly working together to align fiscal policies and reform regulations to attract financing for sustainable urban infrastructure. Adjusting policies can both incentivise changes in corporate and consumer behaviour to take account of sustainability. They can also give a much-needed boost to local revenues, and thus improve the local balance sheet, help close deficits and boost local creditworthiness (see below). They can also directly enable increased public investment in sustainable urban infrastructure, including for upgrades and maintenance. See also Box 18 in Section 4 on PM2.5 and the full costs of fossil fuels. National, regional and city-level infrastructure funding can be redirected away from traditional high-carbon and sprawling urban development. This would significantly reduce the investment gap and release funds for sustainable urban infrastructure, such as mass transit. For example, Bogotá’s BRT system was partially financed by funds that had initially been allocated to urban highway programmes. Similarly, Curitiba, Brazil, is converting a highway into a BRT corridor, complemented by higher-density, mixed-use spaces and green areas – an investment of US$600 million.20 This type of affordable and accessible public transport benefits the urban poor by providing access to jobs, education and wider economic opportunities with less spending on transport. In Brazil, for example, lower-income households in more compact cities only spend 10% of their income on transport, which is much lower than the national average. Cities can leverage the value of their existing assets, mainly land and property, to generate revenue for smarter, more sustainable infrastructure investment and to correct market distortions. User charges and fees can encourage the use of more sustainable infrastructure and are also a way to raise money for infrastructure maintenance and upgrades. They are most suitable for infrastructure amenable to the collection of charges and fees, such as transport and utility infrastructure. One prominent example at the urban level is congestion charges, which can effectively reduce car use and promote public transit by charging for driving a vehicle within a charging zone at a specified time period. This reduces the traffic flow, encourages public transport use, and reduces GHG emissions and local air pollution. London, Milan, Stockholm, Seoul and Singapore have successfully implemented congestion charges and achieved some excellent results in reducing travel time, emissions and accidents (see Table 5), while raising capital for improvement of public transport infrastructure. Beijing and other Chinese megacities are planning to implement similar congestion charges. Well-designed utility fees for energy, water and waste will also raise finance for urban infrastructure while incentivising energy savings and encouraging sustainability. 1. The Congestion Charge in London is an £11.50 (US$15) daily charge for driving a vehicle within the charging zone between 07:00 and 18:00, Monday to Friday. 2. The congestion tax is different depending on the time of the day in Stockholm, but the maximum amount payable per day is SEK 105 (US$12) per vehicle on weekdays; 3. Change in travel volume over 2003–2008. 4. Change in travel volume across the cordon. 5. Change in number of accidents over 2003-2014; 6. Inconclusive from measurements, but from modelled impacts 9–18% reduction of accidents anticipated for different roads. 7. Surplus refers to how much worse or better off all travellers are when introducing charging for society as a whole – the charges are not lost, but become revenues and can be spent on creating benefits for citizens somewhere else in the economy. Property taxes and similar levies, when designed to favour compactness and connectivity in cities, encourage investment in sustainable infrastructure and discourage urban sprawl; they also generate long-term revenues for infrastructure maintenance and expansion. In most emerging economies and developing countries, property taxes contribute a small percentage of local revenue, and they are also under-utilised in many developed countries (e.g. Europe). Property tax reforms can increase local revenues. For example, Bangalore started a series of schemes to improve the assessment of property taxes in 2000. Within the first year, its property tax collection increased by a third.22 In most OECD countries, property taxes are local governments’ main source of revenue, though in most North American cities (such as Toronto and New York City)23, the property tax rates favour residential single-family homes over multi-residential properties, providing disincentives to good urban density. Many rapidly growing cities in emerging economies and developing countries, such as Nanchang and New Delhi, have favourable conditions for development-based land value capture, including strong economic growth, expanding urban population, rising incomes, and increasing motorisation and congestion. These conditions all cause land value to appreciate, particularly near transit stations. Saõ Paulo, for example, has raised more than US$1.2 billion in six years using related instruments. Land value capture schemes also require strong institutional capacities in local government. Betterment levies can not only help recover the cost of sustainable infrastructure after it has been built, but also can be used to fund expansion or upgrading of infrastructure. For example, Colombia established a contribución de valorización (contribution to betterment) in the early 1990s that has helped significantly to finance infrastructure in Bogotá, including funding about US$1 billion of public works between 1997 and 2007, and almost half of the arterial road network that includes the bus lines and dedicated stations of the city’s BRT system.25 In recent years, Bogotá has simplified the betterment levy into a general infrastructure tax by collecting citywide valorisation fees to finance urban infrastructure improvement. Betterment levies require strong institutional capacity of local governments: not only to collect taxes and manage projects, but also to clearly calculate and communicate the potential economic and environmental benefits of any infrastructure project to property owners. Land sales and leases of government-owned property offer a one-off opportunity to generate upfront capital for sustainable infrastructure investment. In countries that do not have an effective land valuation system, land sales are mostly auction-based. For example, Cairo raised US$3.12 billion through the auction of 3,100 hectares of desert land for a new town in 2007. The amount generated was about 117 times greater than Egypt’s total property tax revenue, and about one tenth of Egypt’s annual national revenue. The funds are being used to reimburse costs of internal infrastructure and to improve road connectivity in the Cairo metropolitan area. Similarly, an auction of 13 hectares of land in the new financial centre in Mumbai generated US$1.2 billion in 2006, more than 10 times the total fiscal spending of the Mumbai Metropolitan Regional Development Authority in the previous year.26 The funds are being used primarily to finance metropolitan regional transportation projects. While a potentially useful mechanism to raise upfront resources for smarter urban infrastructure, land sales require a coherent legal framework, strong institutions and enforceable property rights to ensure the effectiveness as a financing instrument. Moreover, once the land is sold, it can be challenging to incentivise sustainable infrastructure development and incorporate its development into integrated city planning. Leases can leverage finance for new infrastructure assets that are systematically tied to a city’s land use plan by allowing developers to lease government-owned land for construction, but with conditions attached. This is used extensively in China. This approach makes it possible to specify sustainability targets, such as establishing energy efficiency targets through rental agreements. There is large potential to enhance sub-national-level institutional capacity to plan better, generate revenues, direct public investment and attract private investment to meet the growing demand for sustainable infrastructure in cities. City authorities will have more influence and impact when they are recognised and supported by their counterparts in national government. Localising public investment decisions can unleash knowledge and creativity for change, but this can only be achieved if there is good coordination within governments and across levels of government, including on funding, financing, investments and increasing sustainable procurement. Often cities receive very limited funding, and national and state- or province-level legislation may also restrict the city government’s power and its ability to raise revenue. When infrastructure challenges extend beyond a city’s administrative boundaries, collaboration is also crucial, as planning for and funding solutions will need to involve governments across the greater metropolitan area. At the national level, a key first step to filling the finance gap for sustainable urban infrastructure is to align fiscal systems to ensure they can respond to and meet cities’ needs. It is also essential to build capacity at the local level to support transformative planning approaches and private sector engagement. At the regional and subnational scales, integrating land use planning with infrastructure planning is a central tool to improve coordination and outcomes. For example, it is important to manage urban expansion in a way that limits the need to drive private cars and promotes safe, affordable, accessible and sustainable transport systems.27 It may also be necessary to consider land use needs for distributed renewable energy systems, and/or to consider the need for flood risk management infrastructure, including buffer zones along rivers and on coastlines, when developing land use plans and regulations. One effective strategy is to integrate land use and transportation planning. This can be done through sector-specific, metropolitan-level agencies, such as in Singapore (see Box 25) or with London’s Transport for London, or through an agency that integrates all elements of urban growth, such as the Instituto de Pesquisa e Planejamento Urbano de Curitiba (IPPUC) in Brazil. The IPPUC prioritises mixed-use development and dedicated high-capacity bus lanes, the backbone of Curitiba’s successful BRT system. Key factors in IPPUC’s success include an ability to leverage dedicated funding sources and a long-term vision, which has been supported by a succession of civic leaders. Another example of integration is Denmark’s “Station Proximity Principle,” which requires new offices over 1,500 m2 to be located within 600 metres of a rail station, reinforcing Copenhagen’s efficient, compact urban form. Several developing countries have been able to overcome structural bottlenecks and create an effective investment system for more sustainable urban development. For example, Colombia’s decentralised model with relatively linked up planning authority and funding has worked effectively (see Box 26). However, in most countries, structural problems and lack of coordination between levels of government and across municipalities in the same region often constrain the levels of public investment, especially at subnational levels. Development co-operation, including through multilateral development banks and other development finance institutions, can play an important role by providing technical assistance to national and local government on long-term integrated land use and infrastructure planning. The Asian Development Bank (ADB) Future Cities Programme, for example, is looking to develop long-term engagement with cities in the context of an integrated plan that considers environmental, social, and economic infrastructure and investment priorities.28 Through bilateral development co-operation, Germany also has made a strong commitment to climate-smart infrastructure and development. Singapore‘s Land Transport Authority (LTA) is an excellent example of the benefits of integrated land use and transport planning.29 Established in 1995 under the Ministry of Transport through the merger of four government agencies, it achieved a high degree of integration by removing administrative boundaries. The LTA is responsible for planning, operating and maintaining land transport infrastructure and systems, including road safety, vehicle licensing and electronic road pricing. In order to reduce carbon emissions, the LTA constantly improves and expands its current public transport network, complementing it with parking policies and electronic road pricing.30 This has led to a shift from private to public transport use over recent years. In 2012, 63% of trips during morning and evening peak times were on public transport, up from 59% in 2008. To increase this number even further, the LTA aims to make the transport system even more accessible and competitive. By 2030, the goal is for 80% of households to be within a 10-minute walk of a train station, 85% of public transport journeys (less than 20km) to be completed within 60 minutes, and 75% of all journeys in peak hours to be via public transport. The LTA’s investments mainly stem from government grants and operating income, such as management fees from the government. Cities often need to build institutional capacity and expertise to prepare and package infrastructure projects into attractive bankable projects for private investors. International support and technical assistance are very valuable in helping cities to strengthen infrastructure project preparation. For example, the Cities Development Initiative for Asia (CDIA) is supporting mid-sized Asian cities to prepare bankable infrastructure projects and bridge the gap between their development plans and implementation. With CDIA’s assistance, more than US$5 billion of large-scale urban infrastructure investments are under development at a cost of around 0.25% of the investments under preparation. The C40 Cities Climate Leadership Group also set up C40 Cities Finance Facility (CFF) to support focus cities in developing and emerging countries to prepare and deliver sustainable, low carbon and climate adaptation projects. The CFF aims to unlock US$1 billion of new low-carbon and resilient infrastructure in developing country megacities, while simultaneously working to build the capacity and skills of city officials, and share new knowledge globally. Spatial and infrastructure planning also needs to be significantly strengthened, at both the national and local levels, and coordinated between them. The World Bank estimates that only 20% of the world’s largest 150 cities have the basic analytics for low-carbon urban planning,33 which in turn limits their ability to build viable project pipelines within a broader system perspective. A large number of developing countries where rapid urbanisation is taking place lack national plans to manage or guide urban expansions. Misalignment between national and local governments in urban planning further complicates the problem. Coordination between national and city policy frameworks (“vertical” governance) is critical for effective and strategic land use and transport planning (see Box 17) as well as for project preparation. India, for example, recently developed a National Urban Transport Policy, integrating transport and land use planning as a single strategic goal. The central government covers half the costs of preparing integrated transport and land use plans.34 South Africa, meanwhile, has used national legislation to create an Integrated Development Plan (IDP) that provides an overall framework for development for local municipalities and coordinates national, provincial and local government policy. The IDP takes into account economic, social and environmental considerations for the area as a whole, including what infrastructure is needed and how the environment should be protected. This helps local municipalities build capacities in planning and deliver sustainable infrastructure projects while attracting additional funds – for instance, from national government and the private sector. The scale of necessary sustainable urban infrastructure investments, which have large public good characteristics, underscores the need to boost capacity for public investment at local levels. Raising public investments to meet growing demand from urbanisation will benefit from devolving some of the authority for planning and revenue raising to subnational governments and by improvements in tax administration as well as by broadening the tax base.35 A large number of fiscal measures are available to strengthen the balance sheet and generate revenues to support sustainable urban infrastructure investment, because as noted above, local governments often earn most of their revenue from local property taxes. However, national and subnational governments will need to work closely together to align policies. The extent to which local revenues and budgets can cover sustainable infrastructure investments varies widely. In advanced economies, local governments are responsible for an estimated 70% of public spending in urban areas and roughly 50% of public spending on the environment and infrastructure, with the other share often occurring in partnership with other levels of government.36 In Latin America, a 20-year decentralisation trend has strengthened the fiscal bases for cities while helping to improve governance and building capacity for environmental innovation.37 In Africa and Asia, however, a high proportion of urban governments still have very limited investment capacities, as most of their limited budgets go to salaries and other recurrent expenditures.38 There are large national differences in annual expenditure per person by local governments, ranging from more than US$6,000 in some high-income nations to less than US$20 in most low-income nations.39 For cities in low-income countries, external development finance is likely to be a key to bridge the gap in expenditures. Filling the financing gap for sustainable urban infrastructure will require both public and private investment. There are multiple ways to attract private investment, including through fiscal measures, improving creditworthiness, municipal green bonds, resource pooling, and investment platforms. Fiscal measures can also be designed to explicitly incentivise private investment. One example would be to ensure favourable tax treatment of municipal bonds that help finance local sustainable infrastructure investments (see below). A key to accessing capital markets is to improve the creditworthiness of municipal governments. Improving creditworthiness can allow cities to both access commercial capital markets and special donor funds for loan-based finance for urban infrastructure investments. Yet only a small number of the largest 500 cities in developing countries are currently deemed creditworthy: around 4% in international financial markets and 20% in local markets.41 This is centrally related to the weak revenue bases that often characterise municipal budgets. The World Bank estimates that investing US$1 in efforts to improve city creditworthiness can leverage more than US$100 in private investment for sustainable urban infrastructure.42 For example, with technical assistance from the Public-Private Infrastructure Advisory Facility (PPIAF), Kampala’s government managed to set out a strategic plan to improve its governance and financial management. In successfully implementing the plan, Kampala has gained a reputation of being an effective, reform-minded and innovative authority. It improved its creditworthiness, achieving an “A” rating (investment grade) at the national scale for long-term debt instruments, increasing locally generated revenue by 83% within a year and almost doubling its borrowing allowance for large-scale urban infrastructure.43 This helped underpin its ability to develop viable sustainable infrastructure projects such as BRT. Municipal green bonds are another way to attract capital. The municipal green bond market, valued at about US$6 billion in 2015, is a relatively small (around 15%), but fast-growing part of the climate-related bond market.46 Issuing municipal green bonds can help cities invest in sustainable infrastructure, particularly in emerging and advanced economies. Major players in these markets are multilateral development banks and investment banks. For example, urban projects account for an estimated 20–25% in the World Bank’s green bonds portfolio. While advanced economies have issued the majority of municipal green bonds to date, growth in emerging economy markets is setting the stage for change (see Box 26). The lower credit ratings of cities of low-income developing countries limit the scope for use of municipal green bonds, but there are examples of them partnering with development finance institutions to crowd in private investment (see below). Smaller cities, accounting for 35–65% of the urban population, also typically face more significant challenges in access to long-term capital markets due to limited financial infrastructure and capacity. In such cases, short- or medium-term loans from municipal development funds or national development banks can help fill the gap,47 as illustrated in the FINDETER example in Colombia below (see Box 26). In sum, municipal governments, national governments and international actors, along with credit rating agencies and other private sector advisors, need to each do their part and work together in order to allow cities to establish creditworthiness and raise their scope for borrowing on long-term capital markets. Concerted action is required by sub-national and national governments to develop clear legal and regulatory frameworks that not only help to appropriate manage and rate credit risk, but that also provide an enabling policy environment for municipal borrowing and bond issuance. Municipal governments need to improve their fiscal management, national governments need to provide adequate support, and international development institutions need to strengthen and scale up technical assistance. Ahmedabad went through the process of obtaining a credit rating in 1995 using India’s national methodology, and received a rating for bond offering. The city was then able to issue a municipal bond worth about INR 1 billion (US$15 million).52 This is India’s first municipal bond without a state guarantee. With fiscal and management improvement, such as a credible accounting mechanism and improved tax collection, Ahmedabad achieved a fiscal surplus from a deficit position. Source: LSE cities background paper; FINDETER: World Bank, 2013. Planning, Connecting, and Financing Cities—Now: Priorities for City Leaders; Climate Bonds Initiative. To reduce transaction costs for investors, investment platforms can be set up at both the municipal and national level to attract private finance at scale to cities. Some megacities have set up exchanges or investment platforms that match infrastructure projects and the needs of potential private-sector investors. For example, the Chicago Infrastructure Trust was set up in 2012, with the city paying US$2.5 million of the running costs, and a pledge from private financial institutions to invest US$1.7 billion in the scheme.55 Smaller cities can also benefit from regional and national platforms, such as the West Coast Infrastructure Exchange in the US and the Green Investment Bank in the UK (see also green investment banks in section 3). In 2009, London set up the London Green Fund, a £120 million (US$170 million) fund for investment in schemes that would cut carbon emissions, including in waste, energy efficiency, decentralised energy and social housing projects through three urban development funds. As of mid-2015, it had invested £97 million (US$137 million) in 16 projects. Resource pooling is an alternative way for smaller cities to establish an investment platform to access capital markets. India, for example, after using a national methodology to establish municipal credit ratings, took this a further step by releasing Pooled Finance Development Fund Guidelines that include special mechanisms to pool smaller cities’ resources and allow them to jointly access credit. In South Africa, municipal pooled financing mechanisms are also currently under discussion as funding options. Cities in developing countries increasingly welcome public-private partnerships (PPPs) as an instrument for bridging the infrastructure investment gap, particularly given their limited access to capital markets (see Box 2 in Section 2 for more information on PPPs).56 For example, several mass rapid transit PPPs have been developed or are under development in India, such as for metro in Mumbai, Hyderabad and Chennai. Bangkok’s Skytrain and Bogotá’s TransMilenio BRT system also used PPPs to attract private investment. Similarly, water PPPs are used in developing countries such as Colombia and various western African countries, and have significantly improved efficiency and service quality, especially by reducing water rationing.57 There are further successful PPP projects in cities in advanced economies, such as bike-sharing schemes in many European cities, a waste management programme in Sydney, and building energy efficiency projects in cities such as Berlin and London.58 Indeed, in some countries PPPs account for a sizeable portion of investment in infrastructure – for example, 5% in Australia and 10% in the UK. Political risks and risks of weak governance can mean uncertainty around the contractual relationships and can mean that the public sector takes on an inordinate share of financial risk, absorbing high costs in the case of failure. In the case of cities in developing countries, national government and international actors may work together to provide necessary support and sufficient technical assistance. In summary, to be effective, PPPs need to work well for both the public and private sector. Success is contingent on a well-designed framework, which requires strong administrative capacity and expertise in government, and a well-implemented contractual agreement with a fair balance of risks and returns between local governments and private actors. Working through and with DFIs not only provides cheaper-than-market concessional finance to blend with non-concessional finance, including from private-sector investors interested in sustainable urban infrastructure, but also reduces the associated risks. For example, the ECOCASA project in Mexico, financed by the Clean Technology Fund, is providing US$52 million in concessional finance to provide incentives for private developers to invest in highly efficient and low-cost housing construction.65 As of July 2016, ECOCASA had helped build more than 16,000 houses, expected to save 630,000 tonnes of CO2 over 40 years relative to conventional housing. In some cases, DFIs through use of concessional official development assistance (ODA) as well as non-concessional development finance are the most viable sources of funding for sustainable and climate-resilient urban infrastructure. They also provide essential technical assistance to plan for it. This is partly because the resulting benefits include a large share of public goods. For example, the ADB, in partnership with the US Agency for International Development (USAID), the UK Department for International Development (DfID) and the Rockefeller Foundation, has leveraged US$150 million for the Urban Climate Change Resilience Trust Fund to support advanced resilience planning in Asian cities and help ensure that resilience measures are implemented. Another example is a project in Haidong City, China, financed by a US$150 million ADB loan. It aims to improve urban water resource and flood management by combining “grey” infrastructure with natural infrastructure in the Huangshui River watershed, including taller flood embankments that can accommodate projected climate change impacts, and a more integrated and holistic approach to flood management with riverside greenbelts, wetland rehabilitation and forestry. Cities are important test beds for numerous clean technologies that can facilitate the transition to a low-carbon economy. It is not only possible, but also economically and socially viable for cities to embrace clean energy to power their homes and businesses. Sustainable urban infrastructure and development challenges are receiving increasing attention from the private sector, relevant professional associations (e.g. architects, municipal planners and engineers), and researchers. The scale and pace of these efforts can benefit from collaborative partnerships with the public sector, notably through public grants and subsidies, to share information and ensure the results meet the needs of city governments. Some cities are already making strong efforts focused on dissemination of sustainable urban infrastructure. Many cities in advanced economies are taking the lead in enhancing urban inter-modality through infrastructure, information and fare integration. In London, more than 70% of people use their smartphones to get updates on traffic conditions, plan their journeys, or top up their travel cards.66 Helsinki is developing a programme that enables people to book and pay for all kinds of trips, aiming to drive down the demand for private cars to zero by 2025. Emerging and new cities in the developing world now have important opportunities to advance sustainable urban infrastructure and “leapfrog” unsustainable and outdated technologies, just as many have already brought mobile telephone service to areas that never had land lines. Some of the most promising innovations right now involve decentralised renewable energy. Early and rapid deployment of renewable energy can bring significant savings in infrastructure and transmission costs, while increasing resilience and reducing emissions. Public subsidies and incentive mechanisms, at least in the short term, will often be essential to overcome market biases against new technologies and practices for urban sustainability. Small, decentralised solar systems built within cities have lower transmission costs and provide more stable power in the face of extreme weather events. For example, ReadyPay in Uganda and Azuri PayGo Energy, operating in 11 countries in sub-Saharan Africa, are demonstrating new pay-as-you-go business models to power thousands of homes via clean distributed solar power while tackling the massive problem of energy access for the urban and rural poor. These financing solutions provide affordable micro-financing that rely on innovative information technology platforms, working from smartphones, to build credit histories over time and scale up investments in a manner that is tailored to individual needs and financial capacity. While much of this activity currently targets rural village electrification, a large untapped potential exists for urban populations, including in rapidly growing cities in Africa.67 In South Africa, EnerGcare is a clean energy services model that is being tested in low-income urban areas and has, to date, introduced over 3,000 of its range of renewable and energy efficient products to residents of three townships, reaching over 50,000 people.68 A common feature of these initiatives is their use of partnerships and the blending of public development finance, private venture capital and other private investors. In addition, local and national governments and businesses (such as state-owned utility companies, clean energy product suppliers) can partner to test and demonstrate new business models, including exploring microcredit opportunities, and to boost markets and deployment of clean energy products and systems. California has also adopted community solar, an innovative solar energy deployment model that allows urban communities to jointly own or lease solar systems.69 It is estimated that if similar schemes or solar energy models are adopted in other US cities, community solar could account for up to half of the distributed solar market in 2020 in the United States. Through the California Solar Initiative, the state also subsidises rooftop solar installed by individual homeowners and businesses, largely benefiting cities. The programme collects funds through ratepayer charges that are then used to co-finance the upfront costs of solar. Consumer investments in distributed solar and energy efficiency have become increasing cost-effective, particularly as prices for solar have dropped dramatically in the last years. They have led to lower demand for centrally delivered power in the state, which has in turn saved ratepayers the cost of investing in new transmission and power generation capacity.70 The current solar subsidy programme was launched in 2007 and will run through 2016; it has a total budget of US$3.3 billion or roughly US$372 million per year, with a goal to encourage Californians to install 3,000 megawatts by the end of 2016.71 The California Solar Initiative also has a relatively large research and development programme, with a separate budget of about US$9 million per year, aiming to boost the capacity to achieve the CSI goals and help keep the state at the forefront of the nation’s technology for solar. Options that combine natural and built infrastructure to deliver urban resilience are also an essential part of urban sustainability solutions. Urban flood control infrastructure and land use choices can build resilience by letting the water in, in a controlled manner, rather than building ever-higher dykes. A prime example is the Dutch “Room for the River” programme.72 This is part of a broader trend in Europe to build waterfront parks, vegetation-lined channels and various other types of infrastructure that double as recreation spaces and flood control. It is also possible to control runoff for flood prevention and while conserving water for droughts. CCFLA, 2015. State of City Climate Finance 2015. Cities Climate Finance Leadership Alliance. New York. Cabannes, Y., 2004. Participatory budgeting: a significant contribution to participatory democracy. Environment and Urbanization, 16(1). 27–46. DOI:10.1177/095624780401600104. Climate Bonds Initiative, 2016. 2015 Green Bond Market Roundup. Barnard, 2015. Climate Finance for Cities.